Cleveland Cinemas will be hosting screenings of highly anticipated concert films and rock documentaries starting in September. DAY OF THE GUSANO documents not only a historic Knotfest Mexico City performance of Slipknot, one of the most exciting live bands on the planet, but delves deeply into the lives of the band's fans as well. Slipknot's fans, better known as "maggots", are essential to the band's legacy. This highly anticipated show captures the chaos, excitement and community that has been cultivated over the past 20+ years. From longtime fans Judd Apatow and Michael Bonfiglio and filmed with extraordinary access over the course of more than two years, MAY IT LAST is an intimate portrait of the acclaimed North Carolina band The Avett Brothers, charting their decade-and-a-half rise, while chronicling their present-day collaboration with famed producer Rick Rubin on their multi-Grammy-nominated album “True Sadness,” which was released on American Recordings/Republic Records. With the recording process as a backdrop, the film depicts a lifelong bond and unique creative partnership, as band members undergo marriage, divorce, parenthood, illness, and the challenges of the music business. More than just a music documentary, MAY IT LAST is a meditation on family, love, and the passage of time. 45 years after Pink Floyd’s David Gilmour filmed LIVE AT POMPEII in the legendary Roman Amphitheatre there, he returned for two spectacular shows, part of his year-long tour in support of his No.1 album ‘Rattle That Lock’. The performances were the first-ever rock concerts for an audience in the stone Roman Amphitheatre, and, for two nights only, the 2,600-strong crowd stood exactly where gladiators would have fought in the first century AD. 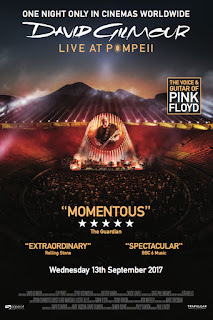 DAVID GILMOUR LIVE AT POMPEII is an audio-visual spectacle, featuring lasers, pyrotechnics and a huge circular screen on which specially-created films complement selected songs, but paramount above all is the astonishing music and stellar performances from an all-star band. The show includes songs from throughout David's career, as well as many Pink Floyd classics, including “One Of These Days,” the only song that was also performed at the band’s 1971 show. Both concerts also saw very special performances of “The Great Gig In The Sky” from “The Dark Side Of The Moon”, which David rarely plays as a solo artist. This concert performance film includes highlights from both shows, filmed in 4k by director Gavin Elder. LIVE AT POMPEII shows an artist at the top of his artistic game, performing incredible material with his world-class band, in a unique setting, on one very special occasion. LET’S PLAY TWO is a concert film that chronicles Pearl Jam’s legendary performances at Wrigley Field during the Chicago Cubs historic 2016 season. With Chicago being a hometown to Eddie Vedder, Pearl Jam has forged a relationship with the city, the Chicago Cubs and Wrigley Field that is unparalleled in the world of sports and music. From “Ten” to “Lightning Bolt,” the concert film shuffles through Pearl Jam’s ever-growing catalog of originals and covers -- spanning the band's 25-year career. Through the eyes of renowned director/photographer Danny Clinch and the voice of Pearl Jam, the film showcases the journey of this special relationship. Tickets are on sale at the theatre box office or online at clevelandcinemas.com.